As the technique of laparoscopic radical prostatectomy has become standardized and widespread, several centers have begun to use these techniques for salvage laparo-scopic radical prostatectomy, and to perform sural nerve grafting during laparoscopic radical prostatectomy. In an early experience from France, Vallancien et al. (58) reported on laparoscopic radical prostatectomy performed as salvage therapy for seven patients. All had previously undergone radiotherapy (external beam radiation in five and brachytherapy in two) and had a rising PSA level with no evidence of clinical metastasis. The operative parameters were similar to those of standard laparoscopic radical prostatectomy; the urethral catheter was left longer (an average of 13 days) because of concerns with healing in a previously radiated field. There were no intraoperative complications or conversions to open surgery. Five of seven patients are continent (71%), and the postoperative PSA at mean follow-up of 11 months was <0.1 ng/mL in five patients. Building on the experience of sural nerve grafts during open RP reported by Scardino et al. (59,60), Tuerk et al. 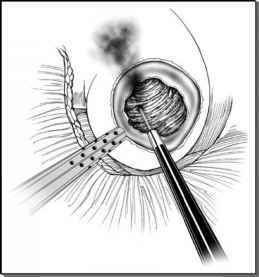 (61) demonstrated the technical feasibility of performing nerve grafting during laparoscopic radical prostatectomy. The use of the daVinci robotic system for nerve grafting has also been reported by Kaouk et al. (62). All procedures were performed successfully, demonstrating the feasibility of this procedure. Long-term follow-up with greater numbers is necessary to determine efficacy. It is my personal belief that for preoperatively potent patients for whom preservation of potency is intended, the dissection of the seminal vesicles first is paramount in laparoscopy.